The strains of bagpipes played by a student band wearing colorful skirts of tartan plaid set the stage Thursday for a Highland-style inauguration of Radford University’s seventh president. Dr. Brian O. Hemphill, whose tenure officially began on July 1, was formally installed during ceremonies at the school that drew a crowd of nearly 2,000. It included representatives from colleges around the state and the country, state Secretary of Education Dietra Trent and some of Hemphill’s former mentors and colleagues from West Virginia State University, where he served as president before coming to Radford. 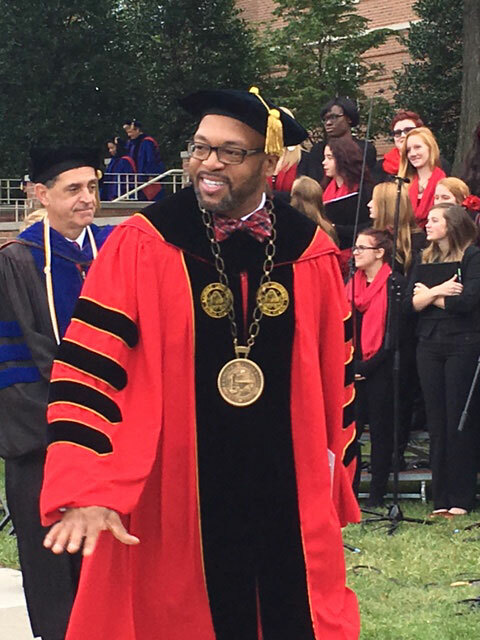 Hemphill, decked out in red and black academic regalia, pledged the beginning of a new era for the 106-year-old school, known for its teaching programs, saying that Radford would move forward with a student-focused approach that embraces innovation to address a changing environment for higher education. “When we began this journey together on July 1, 2016, we made a commitment — a commitment to excellence, accountability, transparency, and student-centeredness,” he said. While retaining its traditional strength in teaching (Radford began as an effort to train more teachers for Virginia’s expanding public school system), Hemphill said it must be willing to look for new opportunities in research and niche markets, including accelerated degrees. Challenges in higher education also represented a theme sounded by the event’s keynote speaker, E. Gordon Gee, president of West Virginia University, who has worked with Hemphill through the years. With tuition prices outpacing inflation, more students are assuming debt, with about $1.5 trillion dollars owed currently. And at the same time, the pay for some jobs has fallen. “It adds up to a crisis,” Gee said.